Flying fish bring to mind old seafaring novels of adventures on the high seas. They’re quite exotic and unusual creatures, but fun to embroider having scales as well as wings. 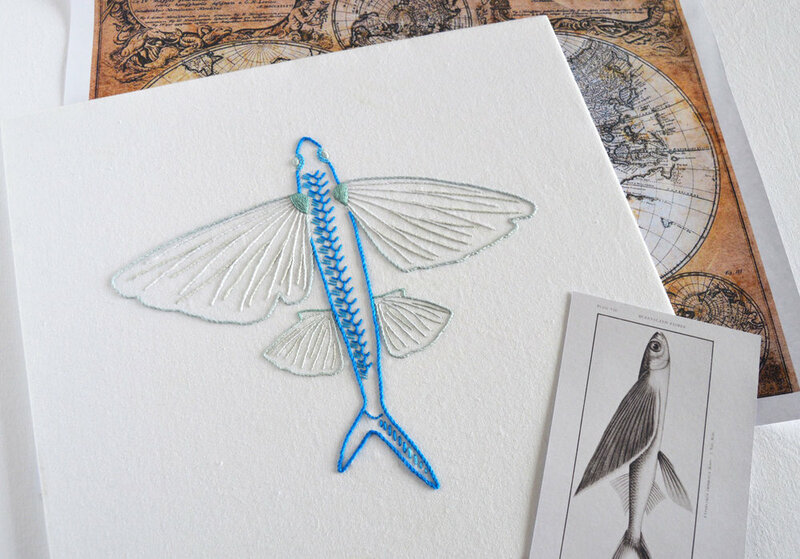 There are some raised stitches in Anatomical Flying Fish, to add texture and interest to the embroidery. And the colours are a combination of vibrant and delicate, to mimic the brilliant flashes of the scales as well as the translucency of the wings. It’s a fun addition to my growing range of Anatomical creatures embroidery designs and the PDF pattern is available as an instant download from Etsy. Note: Bluprint is making changes and as a result, I’m not able to upload any new patterns to my Bluprint shop for now.